Scoops is made from a fuzzy green material with longer green fur on his head. 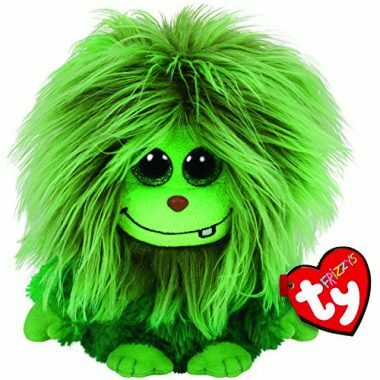 He has large, sparkly green and black button eyes and a brown button nose with black stitching for his mouth and a single white tooth. He has bright green hands and feet. and lay close to the ground. I can never be found. Scoops was released on 30th December 2014. He is one of the original six Frizzys released. This is the larger 9″ version of Scoops. He was also released in a regular 6″ size, in an even larger 16″ size and as a key clip.